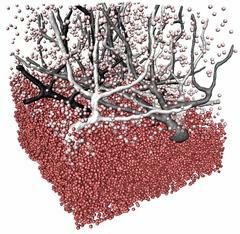 A team of researchers from Göttingen has successfully applied a special variant of X-ray imaging to brain tissue. With the combination of high-resolution measurements at DESY&apos;s X-ray light source PETRA III and data from a laboratory X-ray source, Tim Salditt&apos;s group from the Institute of X-ray Physics at the Georg August University of Göttingen was able to visualize about 1.8 million nerve cells in the cerebellar cortex. The researchers describe the investigations with the so-called phase contrast tomography in the Proceedings of the National Academy of Sciences (PNAS). The human cerebellum contains about 80 percent of all nerve cells in 10 percent of the brain volume - one cubic millimeter can therefore contain more than one million nerve cells. These process signals that mainly control learned and unconscious movement sequences. However, their exact positions and neighbourhood relationships are largely unknown. "Tomography in the so-called phase contrast mode and subsequent automated image processing enables the cells to be located and displayed in their exact position," explains Mareike Töpperwien from the Institute of X-ray Physics at the University of Göttingen, lead author of the publication. The scientists used a biopsy needle to take cylindrical tissue samples from tissue blocks and investigated them with a special phase contrast tomograph developed by Salditt&apos;s research group. Conventional instruments have the disadvantage that small structures and tissues of low density - as in nerve cells - provide little to no contrast and therefore cannot be imaged. The innovative method of the Göttingen researchers is not based on the absorption of X-rays, but on the altered propagation speed of X-rays. The resulting differences in propagation time become indirectly visible through beam propagation on a free flight path between object and detector. "For biological samples, this &apos;phase&apos; contrast is up to 1000 times more intense and is used at PETRA III for imaging structures in the sub-micrometer range," explains DESY researcher Michael Sprung, head of the P10 measuring station where the investigations took place. One micrometer is a thousandth of a millimeter. In order to obtain sharp images, the scientists process the images by computer. They can then reconstruct the three-dimensional electron density of the tissue from the entire tomographic image series. "In the future, we will also use this method to show pathological changes, such as those occurring in neurodegenerative diseases, in three dimensions, for example changes in nerve tissue in diseases such as multiple sclerosis," explains co-author Christine Stadelmann-Nessler, neuropathologist at Göttingen University Medicine. The combination of images of different magnifications enabled the Göttingen team to map the cerebellum over many orders of magnitude. "In the future, we want to be able to zoom even further into interesting brain regions, almost like on Google Maps," says Salditt.